Even in the suburbs, there are bits of forest like the established trees along Watters Creek Trail in Allen, Texas. The trees in this forest are no older than many of the trees in the surrounding neighborhoods, but as soon as I pass out of the forest, the differences in the trees are stark. Full, round, open canopies with leaves that almost brush my head at the edges become dense tufts of leaves far above. Wide, spreading branches with thick joints become anemic fingers, always reaching outward until they snap off in a breeze. In the neighborhood, the tree trunks are long and naked, covered with large wounds. Small trees struggle to survive. Many of them are dead within days of planting, and other small trees are skinny, lichenous trunks and a round nest of leaves, crowned with dead twigs. To the trained eye, the reason for this contrast is obvious. To most people, however, the unhealthy trees in their yard are beyond their comprehension. Note the contrasts between trees along the trail and trees in yards and parking lots, and it becomes clear: Trees left alone are usually healthy and beautiful, and trees that are mistreated by humans are not. As the Suburban Ecologist, it is my job to explain what we are doing to our trees that is killing them. You may be surprised to discover that taking better care of trees is easy. It begins at planting. Once your tree selections have been made (See Part II: Tree Selection), do a web search of the tree name to gather pertinent site characteristics and watering needs. Most native species require little watering after they are established. In fact, too much water will cause them to rot or suffocate the roots. Remember, the roots extend all the way to the edge of the tree canopy and beyond. Trees will die if they are planted too high or too low in the ground. After planting a tree, place your heel on the ground and your toe on the root ball. Your toe should point up at a 45-degree angle. Make sure that the root flare at the bottom of the trunk is exposed, but the roots are covered. Planting too deep is an extremely common mistake that results in suffocation and eventual tree death. The same result occurs with too much mulch. More than four inches of mulch will choke the roots. A mulch ring is helpful to prevent nearby plants from siphoning away water from a young tree, but mulch touching the bark will spread disease. Periodically brush away any mulch touching the base of a tree. Trees need to dry out completely between each watering. During the first few months after planting, check the soil around the tree to make sure it is neither soggy nor cracked and powdery. Either extreme will kill the tree. If algae is growing on the bare soil, it is certainly too wet. Adjust your sprinkler settings. Watch for heavy rains in the forecast. If it is raining, turn your sprinklers off, and wait until the soil dries out completely before turning them on again. After a sustained deluge, this can take up to a week. Once a tree is in the ground for three to four months, it will have a higher tolerance to wet or dry conditions, and it will not need to be checked very often. Paying attention in the early months of planting will help to set sprinklers on a regular schedule that maintains the tree without drowning it. Native trees that are established for six months or more only need watering during sustained drought, and sprinklers should be kept off of them. Why waste the water? If grass won’t grow underneath the tree canopy, try planting Liriope, flowers, or bushes that enjoy partial shade and less water. An aside: many people accuse their trees of killing their grass, when it is in fact their dogs. If a dog is penned up in a yard, it will gravitate to the base of the trees for shade and cause a nice bare patch of soil. So far, this article describes things to do. The next section describes things to not do. Ironically, doing nothing is actually much harder for most people, especially those who want their yard to look like a golf course instead of a thriving garden. Trees require leaves to survive. Each leaf is a tiny power factory that provides sugars to the tree. Leaves should never be removed unless absolutely necessary. The lower branches of a tree are fine unless they are hitting people in the head. Don’t cut them off! The most common pruning procedure in North Texas is known as “Lions-Tailing.” This disastrous technique was invented on golf courses to enhance vision down the green. It involves frequently cutting off all the lower branches and “suckers,” small twigs that grow on the trunk to give the tree added nutrients. The results are dramatic. Trees develop large scars on their trunks that never heal. The upper branches, forced to replace the missing leaves, grow rapidly and become too heavy on the ends. The skinny branches take the shape of a lion’s tail instead of combining to form a natural domed canopy. Every time it rains, a lions-tailed tree breaks beyond repair. The trunks snap or the top-heavy branches fall, ripping out huge holes and peeling away bark to expose sensitive tissues. Often, they break off without even a breeze, victims of their own weight. To avoid loss, do not let a landscaper prune your tree unless they have a professional arborist certification. Do not trim trees every year. At most, authorize trimming every other year, and it is best to wait three to five years between trimmings. Never cut off more than 25% of a tree’s leaves at one time. Above all, recognize that a healthy hardwood tree has leaves on three-quarters or more of its total height. If a hardwood tree only has leaves on the top two-thirds, it is at a very high risk of failure. This does not apply to pine trees or palms, which form a natural umbrella shape. With these, only remove dead plant tissue unless the limbs or leaves are invading a building or other structure. When removing limbs from pines, cut the limbs all the way back to the trunk, otherwise the limbs will die off and become hazardous. Leave the ridges at the base of the branches, because they contain chemicals which help the wounds to heal. I urge you to share this article. We need trees to absorb light, provide shade, filter water, reduce flooding, retain topsoil, feed wildlife, and beautify our surroundings. Many people who realize the benefits of trees plant them and then kill them shortly afterward. This must stop. We who have knowledge have the responsibility to spread it to those who don’t. If you want to, click the Follow icon in the lower right corner and enter your email to get an update when I release my next article, The Suburban Ecologist, Part IV: Streams. 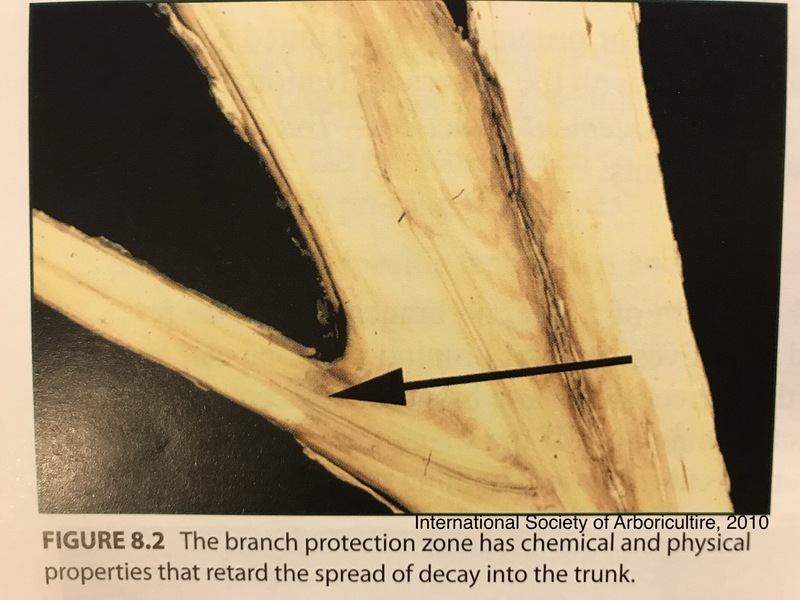 For more information on tree care, check out the free podcasts on The International Society of Arboriculture website. Thank you for participating in this effort to make our suburbs healthier, more productive, and beneficial to both wildlife and humans. Very informative, I have just read the previous two articles also. Thank you. I appreciate your input, David. Recent science has discovered even more benefits of trees. Please stay tuned for The Suburban Ecologist, Part IV: Streams. I will explain why growing trees along waterways improves the quality of human life. I love your site, http://www.reparativevegetation.com.au/. I see that you provide work to a local contractor and the web galleries are terrific. I am a bucket truck operator and line clearance climber. Good job and nice cuts. You should give a copy of Jeff Jepson’s “The Tree Climbers Companion” to each foreman. You should also pick up a copy. The book provides the best practices possible for tree health in easy language and lots of illustrations.